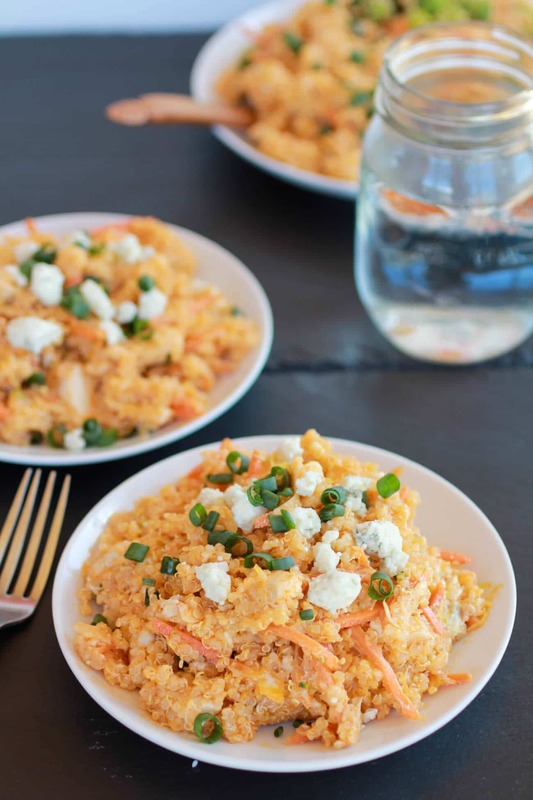 Alright guys, I have got a good one for you…Buffalo Chicken Quinoa Salad. Seriously, this one is going to rock the blog world. Well….at least I think it should. Anything involving Buffalo Sauce rocks. No questions. Buffalo Chicken is a very much-loved food around here. Every time I make it for my Dad he say’s “You could sell this stuff. We need to open a restaurant devoted to all things Buffalo Chicken.” Really he say’s it every time…..and I love it! After all, the reason I love cooking so much is seeing how people react to my food. It is the best when someone loves something! And I know something is good when I get my dad’s stamp of approval. Don’t get me wrong he will eat just about anything, but for him to say something is really good, means it is really good. He is kind of a toughy. No joke, this is the best quinoa salad out there. I mean guys, it is Buffalo Chicken. It’s healthy, quick and super simple. That right there is enough reason to make this. I added some broccoli and carrots for crunch and some blue cheese just cause well, blue cheese is delicious and in my opinion you can not do buffalo sauce without some blue cheese. It’s just awesome. Perfect snack, lunch or dinner. I am kind of obsessed. Really if you are out of quinoa you are going to want to go to the store. Now! Cause I am pretty sure you need to ditch all other previous plans for dinner for tonight and make this. It is just too good not to make. Ok…here’s how you do it…. First, the quinoa……..rinse and drain the quinoa. Add to the pot with water and bring to a boil. Cover and turn heat to low……Cook about 20 minutes until all water is absorbed. Remove from heat and fluff with fork! The buffalo sauce dressing…..yuuummmmmm. In a small bowl, whisk olive oil, hot sauce, and seasoned salt. Set aside. The chicken……Heat a medium sized skillet on medium-high heat. Add 1 T. olive oil and saute the broccoli for about 5 minutes. You want it a little soft, but still crisp. Remove from pan and set aside. Add the chicken to the same pan and cook for about 5 minutes until cooked through. Add 1/4 C. of the buffalo sauce dressing until the chicken absorbs most of it. 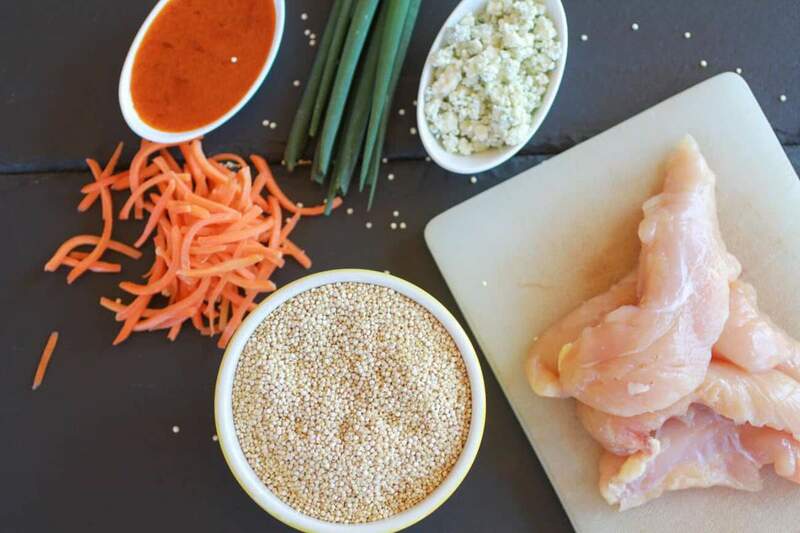 Assembling….When everything is ready, add the quinoa to a big bowl and toss in chicken, broccoli, carrots, shredded cabbage, and buffalo sauce dressing. Toss to combine the dressing and all the chicken and veggies. Mix in the blue cheese and half of the green onions. Toss again. 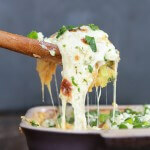 Serve warm with extra blue cheese crumbles and green onions on top!! YUM! A healthy, quick and super tasty salad! Meanwhile, make the buffalo sauce dressing. In a medium bowl combine the olive oil, hot sauce, and seasoned salt. Whisk to combine. Set aside. Heat a medium size skillet over medium high heat. Add a tablespoon of olive oil and cook the chicken for about 5 minutes or until cooked through. Add 1/4 cup or so of the buffalo sauce and cook until the chicken absorbs the sauce. Add the broccoli and cook 3-5 minutes or until the broccoli is tender. Remove from the heat. In a large salad bowl, toss together the cooked quinoa, chicken, broccoli, carrots, shredded cabbage, and as much of the dressing as desired. Add the blue cheese and half of the green onions. Toss again and serve warm with extra blue cheese crumbles, the remaining green onions, and avocado. Seriously, go make this now. You’ll be so happy your did! Oh, no your a blue cheese hater?!? We love blue cheese, but I know some people don’t. I would swap in some cheddar! YAQ I am so glad you guys liked this! This looks fabulous! We are big buffalo fans in our house and I’m sure this would be a hit. I love the quinoa! Yum! My husband would love this!! This looks amazing – I recently tried Frank’s for the first time ever (I know, I’m behind on the times here) and I’m obsessed with it. My husband LOVES buffalo anything – he’d go nuts for this quinoa. We don’t eat much chicken – what do you think would be a good substitute for the chicken breasts? Maybe tofu? I make this without chicken all the time! I like to just add extra broccoli. We are not big on tofu, but chickpeas or black beans are also delicious! Enjoy! Thanks for the suggestion! I’ll try doubling the broccoli. I may try some extra firm tofu in there some time and see what happens – I’ll bet the tofu would soak up all of the Frank’s hot sauce and end up being delish little sauce bombs. I love quinoa – so versatile. I did a spinach quinoa “mac & cheese” that was a big hit at our place – I’m always looking for another fun way to use it. Thanks for the great recipe! Frank’s on popcorn will change your life. You know, I haven’t gotten on the quinoa bandwagon yet but this is the most I’ve ever been tempted. I just found your blog through Paleomg. You’re awesome! You just blew my mind with this. Seriously. Thank you a million times over! I’ve been kind of obsessed with quinoa lately so I’m always excited to find new things to do with it. 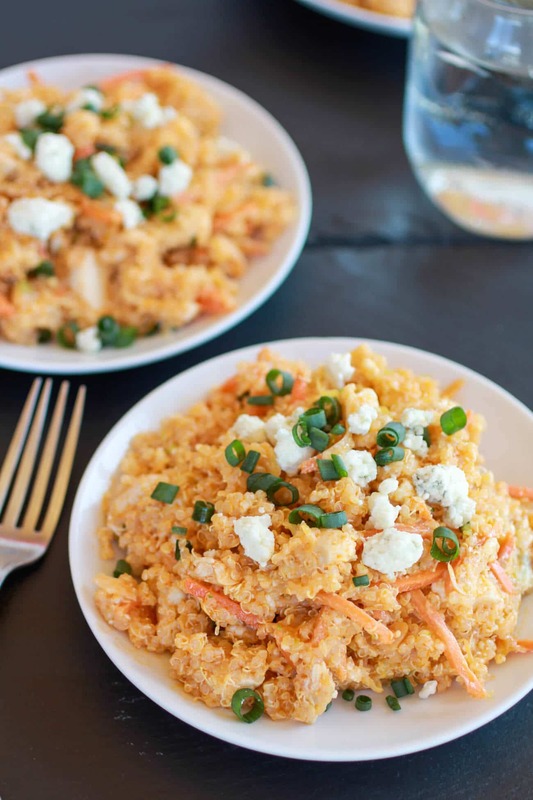 I love buffalo chicken too, so mixing it with quinoa is right up my alley! I’m totally pinning this so I can make it soon. Thanks! You know, I think you’re totally onto something here! My mouth is watering! Love to make people mouths water! I immediately printed this recipe…it looks amazing! I am so glad to have found your lovely blog. Your photographs are simply beautiful. Thanks for sharing this with Foodie Friends Friday. Quinoa is one of my favorite grains. Your recipe sounds delicious. Oh my goodness – I thought I had seen everything buffalo, but this is new. And so creative! Love it! 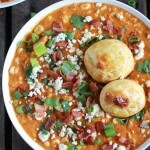 I can’t handle any spicey-ness in my food but this recipe looks so tastey! Any suggestions on what I can swap with the Franks? I do believe you’re my soul mate. Yummy! I have a whole bunch of quinoa I’ve been wanting to use up. Definitely going to try this. I am drooling over here! LOL This looks so good!! I pinned it for later and would love for you to link this up at my linky party Thursday at http://www.juliakendrick.com! I hope to see you there! I’m actually from Buffalo, and LOVE all things with buffalo sauce. this is on TOP of my must make list. This looks really good. We’ve been on a buffalo chicken kick around here lately. Think this could be a good first way to add Quinoa and see what we think of it. 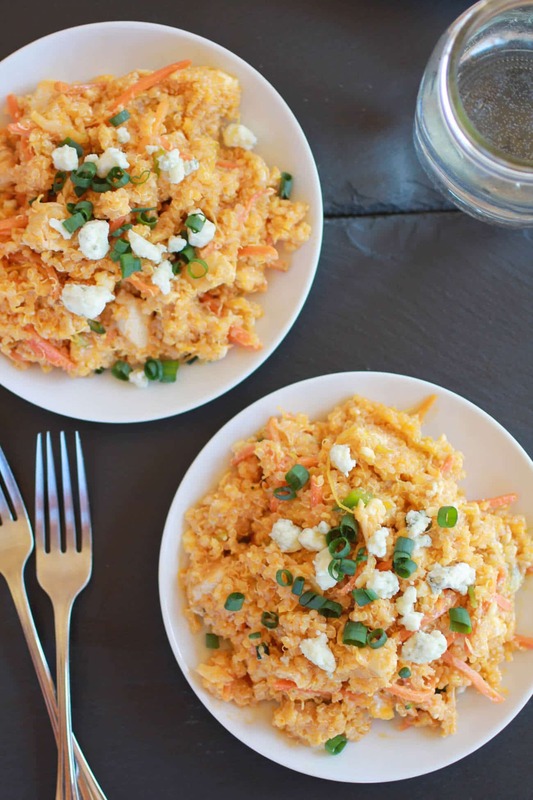 This would be a great dish for new quinoa eaters! 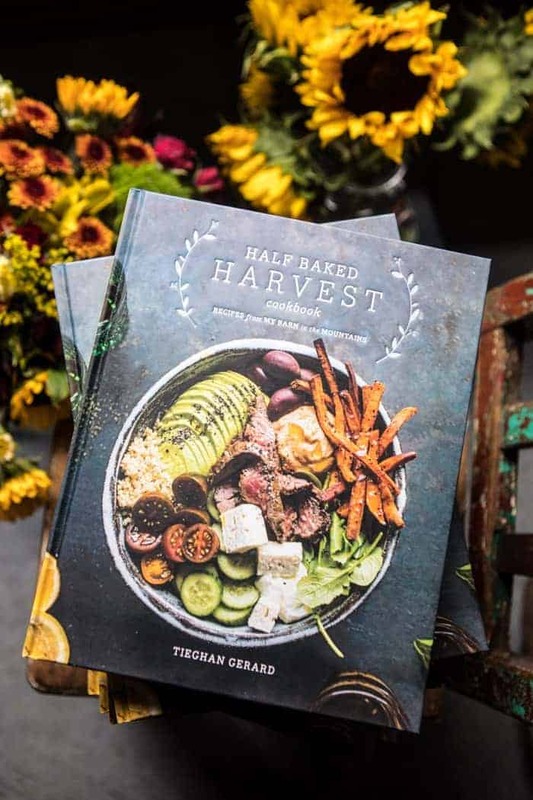 Tieghan (pretty name) This salad looks delish. I have a quinoa salad that I love making but I cannot wait to try this one. Thank you for sharing. So glad I saw your link on Cheerios and Lattes. Would love for you to stop by and say hi. Thanks for the recipe. I just made it and loved it, although I forgot the carrots and I can’t do onions. I made your dish and LOVED it! However, I have just started counting calories and I am curious if you know what the calorie count for 1 cup of this dish is.. I put it in my counter and it was on the better side of 750 per serving. Please tell me I’m wrong…. I am pretty sure that it was to high! I calculated between 380 and 400 calories! Much better. So glad you liked this! Just to clarify- you do use frank’s buffalo sauce, even though you say “hot sauce” in the recipe ingredients? Because frank’s makes both a buffalo sauce AND a hot sauce!! Thanks, I can’t wait to try this! YUP, I use franks hot sauce (not the buffalo)! In my opinion nothing is better than franks! You do realize that you say both “hot sauce” and “buffalo sauce”…..its a bit confusing….I have the Franks version of both and was bit confused on which to use. I chose to use the “buffalo sauce..given the name of the recipe…putting in 1/4 cup of the buffalo sauce ( didn’t realize you meant part of the “dressing”) while cooking the chicken was a bit painful….not sure if the pan was to hot ( although I don’t think so) but the fumes from the sauce while cooking the chicken was a bit much…. I”ll admit that the Franks Buffalo sauce, chicken, and some quinoa did make for a nice “snack” for the rest of the week. Hi Amy, sorry it was confusing for you. 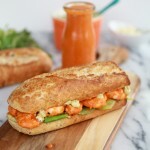 For this recipe I make my own version of buffalo sauce using the Franks Hot Sauce (not the buffalo sauce). I will have to go and re-read my recipe and try to make it less confusing. Glad you still enjoyed the dish though! This looks delish! 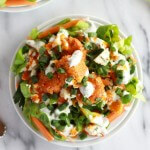 Anything with buffalo chicken is a win! Beautiful photos too by the way! We love buffalo sauce and thank you! This IS a good one. I’m running out of ideas for all the quinoa I bought, and my husband doesn’t seem to like quinoa, but loves hot sauce. This recipe may just be the one to turn him! Oh, I hope he likes it! This is genius! I am all over it! I am always trying to find ways to get my family to eat quinoa and love it like I do– this might do the trick! Seriously so smart. Thanks! Oh. My. Word. This looks amazing!!!! You are totally right! Anything with buffalo sauce ROCKS!! This looks sooooooo good, I can’t wait to make it! This is amazing. Amazing. This was my first foray into the world of quinoa, and it is certainly not my last. Nor is it the last time I will try a recipe from your fabulous blog. I live very close to my office, and I made this on my lunch break. It was quick and easy to throw together. I was blown away by how good it was, and with the nutrition counts. I calculated the nutrition, and it is about 200 calories per serving (if the recipe is 4 servings), 5 g of fat, 25 protein and 12 carb. You cannot beat it! I brought my assistant a serving for her lunch, and she was also blown away. I can hear her scraping the bowl as I type this. You have a gift, my friend. Thank you!! I am so glad you loved this!!! I love your comment! it is to nice!!!! Thanks so much for letting me know how much you enjoyed this! Just made this for dinner tonight and it is FANTASTIC!!! Thank you!!! I made this tonight and it was very tasty! It was a bit oily so maybe next time I will use less oil for the sauce and I used celery instead of broccoli it was great!! YAY! I am so glad you like this!! Thanks for letting me know! I made this tonight for dinner. Left out the cabbage because I had none, and used fresh mozzarella in place of blue cheese. It was very good! YA! I am so glad you liked this! I am so glad you like my recipes! I wish I could provide the calories, but at this time it is just to hard for me to do. My 1st Quinoa recipe, just made this it’s delish! Ready to continue on the Quinoa adventure! Thanks for sharing this! I am so glad you liked this!! I have some more quinoa recipes in the works so check back! Do you need to use all that oil? No. You can use less, but be ware the the less oil you use the hotted the sauce will be. Also, you can just use less of the sauce on the quinoa. It really does not need all of it. We just like things extra saucy! Great recipe! I linked it in my blog. Stop by sometime to check out my gf/df recipes! Thanks so much, I am so happy you like it! Oh my goodness! I made this last night and I can’t wait to get home to eat the leftovers! I tweaked it a little by putting in celery, and using red onions (I had them on hand). I also subbed out most of the oil with chicken stock to make it “healthy” It was so good! Ya! I am so glad you loved this! What a good idea subbing the oil for chicken stock! Just found this on Pinterest and am literally eating it right now. I have never made quinoa before, but there was a huge bag of it in the pantry. I only had the Asian chili hot sauce, but still, this is soo yummy! YA! I am so glad you like this! Thanks for letting me know me know! I will definitely be making this soon! It looks very similar to the Buffulo chicken bowl I get at Protein Bar which I LOVE. I’ll be making it with blue cheese, but none for the hubby – hes not a fan of blue cheese. Thank you so much for sharing, can’t wait to try it! I hope you love it!! PS. Blue cheese is the best! Your husband is missing out! I tried this last evening and it was AWESOME. Can you tell me the nutritional value on this recipe? I tried to calculate it and I got almost 550 calories per 1 cup serving is that correct? Seriously….this is genius. All of my faves in one dish, and never thought to put them together myself! I cut back a little on the oil, and added more Franks (I like it hot hot hot!). I had to restrain myself from digging into the rest I am saving for dinner tomorrow! Great recipe- a must try for anyone that is debating it. Thanks for such a nice comment stephanie!! I am so happy you love this! You reminded me I need to make this again! Thank you so much. My husband and I love this recipe. I would normally never comment on a website, but this recipe was so good, I had to thank you. We could eat this every day and it is so healthy. I am a big fan of quinoa, but haven’t found too many great recipes. I don’t think this one can be beat. Aw wow! Thank you!! I am so happy you guys loved this!! That makes my day!! 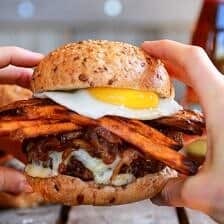 Do you know the calories/fat/protein for this? What would a serving be? I honestly have no idea, but a serving would be 6 or 7 seven quinoa bites + 1/4 of the salad. Sorry I was not of more help! Hope you love this! YA! I am so glad you like this and great idea with the oil, I will have to try that! Hi, Quick question: for the step where you “Add 1/4 cup or so of the buffalo sauce and cook until the chicken absorbs the sauce” – is this 1/4 cup of the “dressing” recipe or is this an additional 1/4 of frank’s hot sauce in addition to the dressing that will be added to the whole dish later? Making it tonight and want to get it right. It is apart of the dressing, hope I am not to late and I hope you love this! I made lots of tweeks, but super tasty! I’ll have to try it with quinoa some day! This recipe is fantastic – we can’t get enough of it! Thank you! I am so happy you love it!! Ijust made this for dinner and it was a huge fit!! We’re all on diets, so I added more veggies, no blue cheese and less chicken and less oil. Thanks so much for the wonderful recipe!! I never would have gone buffalo with the quinoa. Brilliant! Ya! So glad everyone liked it!! This is on of my families favorites! Hoping to make this for picnic tomorrow- it looks sooo good! Has anyone tried it cold/room temp? I prefer it hot, but I really like hot foods! Most people would really enjoy this at room temp and even cooled. Hope you have a fun picnic and enjoy this! sounds delicious!!!! Do you think it could be made the day before and served cold for a picnic? No problem! Hope you love this! Thank you for this! I am on a journey to incorporate new foods in my diet and am obsessed with buffalo anything! I do have a question. Does this store well, and if so, how should I store it. I have been looking for something tasty to take to the beach and I am wondering if this would work. Thank you! Oh, I see answers above me, thanks guys! Haha! Thanks Jessica! Hope you love this!! This recipe was OUTSTANDING!!! My husband and I both loved it. Definitely my favorite adventure with quinoa so far ha. Shared your deliciousness with my readers here: http://seektobemerry.blogspot.com/2013/07/hump-day-distractions_31.html Thanks for the inspiration!!! YEAH!! SO happy you guys loved this!! Thanks for making it! I made this dish about two months ago and we loved i! Tonight, I am making it again. I am going to use melted Smart Balance (cholesterol free) instead of olive oil and will shred the chicken a bit. This was unique and wonderful! Thank you, thank you! Yes! So happy you love this dish. It is one of my families favorites as well. Thanks Wanda! I made this tonight, and OMG YUM!!!! I love anything buffalo AND anything with blue cheese 🙂 I am counting calories however, and I wasn’t anticipating it being as many calories per serving it was (I did 4 servings, and I calculated it to be ~621 calories) I will definitely make this again, but next time I’m using less oil. Thanks so much for the awesome recipe! Thank you so much, Liz!! I am so happy you liked this and thank for the calorie info! I will have to try reducing the oil myself and see how it turns out. Thanks again! 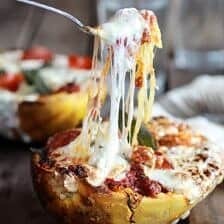 I don’t know how this is the first time this recipe has come across my radar but it looks amazing! I’m a HUGE fan of any buffalo and can.not.wait to make it next week for dinner! Oh yeah!! Hope you love this!! I found this recipe via Pinterest. I am a vegetarian, but this looked too good to pass up! I made it without the chicken and it was delicious. One other small tweak, I’ve always cooked quinoa in broth rather than water and had some homemade vegetable stock on hand so used that. So glad you still made this! I make this all the time minus the chicken since my family is not all that big on chicken. We just really like buffalo sauce!!! Thanks for trying it , Erin!! LOL! I just made this tonight! It really is so good! I am so happy you guys loved this and are now quinoa lovers! Yes!! Yes! So happy you loved this!! Thanks Hillary! Hi, I made this tonight and subbed the oil with non fat greek yogurt to cut back on calories. It was amazing!! Thanks so much for making this, Alyson!! So happy you loved it and I love your swaps! Am I the only one who can’t see the broccoli in the photos? I didn’t think I was THAT blind. So, is there actually broccoli in the version photographed at the beginning of the recipe, or did you decide to omit it? Ha! I promise there is actually broccoli in the photographed dish and it is good! I actually hid some of it on purpose because I did no not want some people to get turned off by the broccoli, but we LOVE this with the broccoli and again, it promise it is in there! Okay, good to know! I can see it one or two of the pics, but not others, so when I was grocery shopping for the recipe I forgot the broccoli (since I didn’t remember seeing it). Instead, I diced up a bunch of celery and put that in, plus added extra carrots and cabbage. I’ll be sure to use the broccoli next time, as I love it! Hi Kayla! I wish I could help you, but I do not no the nutrition for this. You can calculate it online though! This recipe is so sooo good! It’s a regular in my household! My husband I just love it!! Thanks for sharing!! YAY!! So happy you love it!! Thanks for reporting back, Lindsay! I made this for dinner last night – SOOOO good!!!! Everybody loved it so much, even the first time quinoa eaters couldn’t get enough of it. YAY! So happy you love this! Thanks for making it and reporting back! Wow this looks AMAZING!!! I love any and all things buffalo chicken [really, it’s just a vehicle for blue cheese for me 🙂 ] and this is a new one. I’m making it tonight!!! Thanks so much for this delicious recipe! Thanks Caroline! Hope you love it!! Hi! Can’t wait to make this. Just to clarify- Do you use the original Frank’s Red Hot or do you use the Frank’s buffalo sauce?? Thanks! I use original. Hope you love this! This was AMAZING!!!! Thank you!!! My whole family enjoyed it! ya! So happy you guys loved it! Haha! Thanks so much, Kimberly! So happy you loved this! Made this and LOVED IT. I used a store-bought bag of “Broccoli Slaw” (which already contains carrots and cabbage) to save time. It came out great! My husband and I think this is our favorite recipe we’ve tried in a long time. Thank you for the recipe! Truly amazing recipe. I love quinoa salads, and am always looking for new ideas. I used about half of the oil, and didn’t miss it. I also subbed leftover rotisserie chicken, which sped up the process. 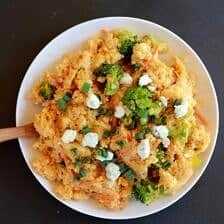 My teenage boy loved it as well, but my 5 year old wouldn’t touch it as he hates foods that are “mixed.” This will become a regular in our house, and I am sharing this recipe! 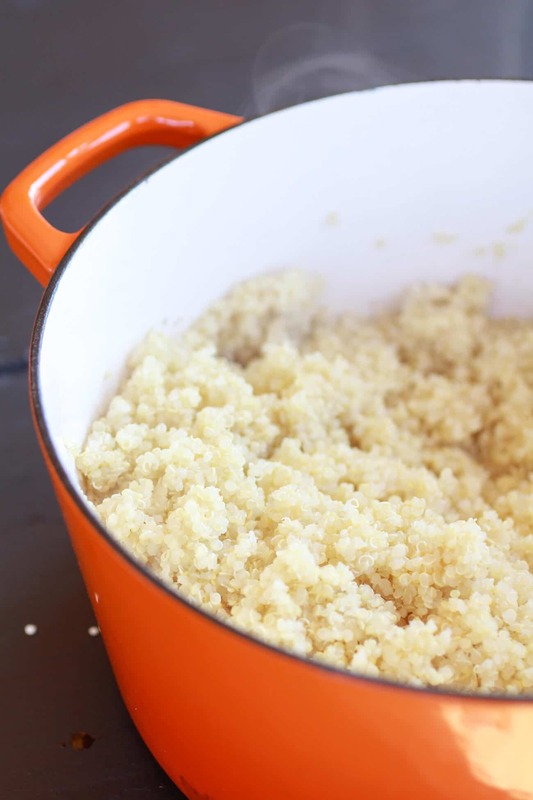 This is such a fantastic recipe (the ONLY way my husband will eat Quinoa!!). It’s so flavorful and healthy. Rather than sauté my veggies, I steamed them for a slightly healthier version and also cut the olive oil back a bit.. Amazing. I pinned it, saved it to my favorites and also shared it with my friends and family on Facebook! i made this the other day and it was delicious! which was surprising because lately I dislike chicken and haven’t found a good quinoa recipe. So, I was thrilled!….However….. I put this into my calorie app and found out this has A TON of sodium!! if you divide the recipe into 4, each portion has 1140mg sodium from the hotsauce alone (from franksredhot.com, original).. thats insane!! I WILL make this again though and try to highly reduce the amount of hot sauce in this. but, the recipe was delicious. thank you! We were at a large neighborhood and someone brought this dish. My husband who is a very laid back guy got all excited about this dish. We saw ~20 people taking photos of the recipe and it was the first (and perhaps only dish) to be completely cleaned out. Anyway it has become a fan favorite in our house! My husband had sworn he’d never eat quinoa again, however, he’s a sucker for anything buffalo! Huge hit in my house tonight. Thanks! YEAH! So happy this was a hit, THANKS! Hi sounds delicious!!!! Do you think it could be made the day before and served cold for a picnic? I do, I think that would be great! Hope you love this! My family loved the recipe. The sauce was a little to spicy for me. We will try a different one next time. So happy you guys loved this! To tone done the heat level, just use a little less hot sauce. Hello! 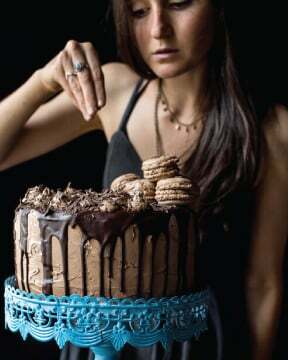 I am so going to make this tonight!! Right. Hope you love it! Hi there! 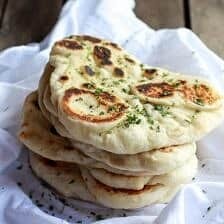 I just found this recipe and I’m hoping to try it tomorrow! However, I try to keep my calories on the lower side for dinner, and I know with the quinoa it’s a bit unavoidable, but I was wondering if there’s any substitution that could be made for the olive oil, or the amount of olive oil, in the sauce? I obviously haven’t made the sauce yet and I don’t wanna mess with a good thing!! But I was hoping to cut a calorie corner somewhere, and it seems like maybeeeee the olive oil could be the place (or maybe use less olive oil, and substitute something else in?). Thanks! 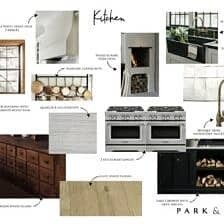 And really looking forward to making this tomorrow!! Sorry I am just getting to your comment now. You can just reduce the amount of oil in the sauce. Just be ware that the less oil you use the spicier the sauce with will be. Hope you love this! I used less oil and added some Bolthouse Farms Yogurt Ranch to take away some of the spice. It was DELICIOUS. Great recipe. do you mean cauliflower? because i don’t see any broccoli in there? thanks! Thank you so much for this recipe! I found it a while back and it has become a staple at my house! I’m a vegetarian now so we do it with tempeh or just without the meat but it definitely helps with any cravings I get for wings! YAY! That is awesome! So happy you adapted it to your needs! Thanks! Is there a way to make the same amount of sauce but cut the heat in half? The amount of hot sauce was too much for us, but I don’t want to lose the quantity of sauce…if that makes any sense?! Other than that, it was delicious!!! 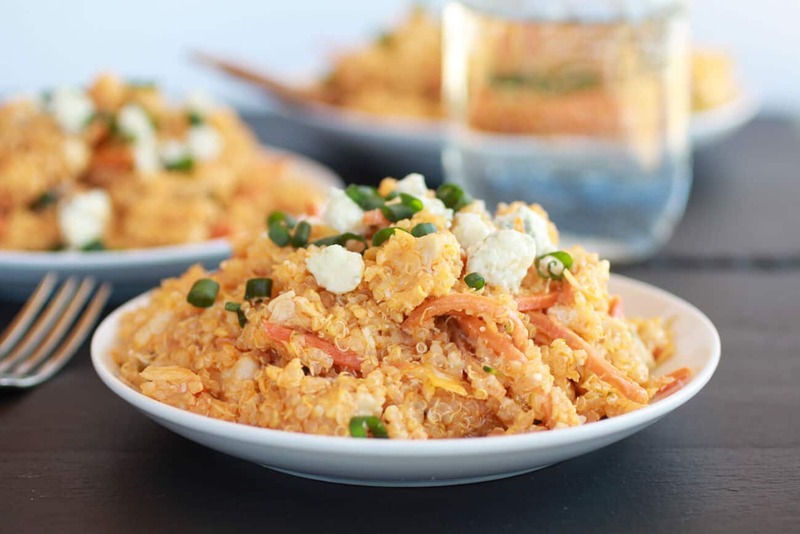 Just a quick question for someone who’s not a big fan of spicy…what would be a good substitute for hot sauce but still making it a buffalo-type chicken quinoa? thanks! Hi Sam! Hi would just halve the hot sauce. I think that will be a pretty mellow spice. HOLY COW, THIS WAS GOOD. I made it tonight and FELL IN LOVE. The recipe was so easy that I can totally re-create it without looking next time, especially with my slight adjustments (more broccoli, no cabbage/carrots). Totally crave-worthy and delicious, and I’m bringing leftovers for lunch tomorrow! This sounds AWESOME! Quick questions, do you add the 1/4 cup of buffalo sauce while the chicken cooks in the pan or after the 5 min the chicken has cooked? Also, when you add it all together (at the end) is the “dressing” in addition to the 1/4 cup of buffalo sauce you added to the pan? Can’t wait to make this, Thanks so much!! Hi! You add the buffalo sauce to the chicken after it is cooked and yes, the dressing is addition. Hope you love this!! Would you happen to know the nutrition facts of this? This looks amazing. Can you clarify if “Buffalo sauce” and “Dressing” are the same thing? In the direction for cooking chicken, you mention cooking it in “Buffalo sauce,” but then in the second paragraph you refer to “the dressing.” Do I cook the chicken in sauce from the jar or do I use the dressing for cooking the chicken? Would love clarification so that I can make this. Looks fabulous! Hey Sheila! Sorry for the confusion. Yes, buffalo sauce and dressing are the same thing. Hope you love this! THANKS! I loooooove buffalo sauce and love an excuse to put it on anything and everything! Thanks to you I can put it on quinoa now too! I featured it in my latest post, “Kick Start The New Year #3: 15 Healthy Lunches”. Made this last night and I have to say that it is way too salty for my taste. I would maybe cut the seasoned salt down to half or even a quarter teaspoon. Other than that, it was pretty good. I’ve already made this twice this week, it’s delicious. Thanks for posting! Made this for my meal prep this week… Was wondering if you could ball park the calories per serving? Would really appreciate it. Recipe is so great and it’s something I plan to keep making. So easy and tasty! Sorry Maggie, I really have no idea. Happy you love this recipe! Found your blog through the feedfeed’s Instagram and this recipe through your “Top 14 Super Bowl Recipes” post. I made it 3 nights ago and my husband and I loved it! It’s delicious and easy enough that I could make it on a weeknight with a 6-month-old. It’s pretty much all I ate for 2 days… and then I made a second batch last night. Thanks for the recipe – it’s definitely going into the rotation! Hi There– I’m planning to cook this tonight and am very excited! One thing– I can’t always predict when we’re going to exactly sit down for dinner. How do you recommend keeping this warm for up to 30 min or so before we eat? We’ve made this several ways, which are also winners– sub 1lb cooked chickpeas for chickens, sub barley for quinoa, sub shredded brussel sprouts for cabbage. good warm or cold— take for lunch too! Thanks so much, Steven! So happy you love this salad! My sister adapted this to a crockpot recipe and it’s just as good! Hi Whitney!! That is so awesome, what a great idea! Thanks so much ? I make this all the time! It’s delicious. Tonight I made it with red onion instead of green. I’d like to have the calorie information. Hi Lisa! I am really happy you love this recipe, that is awesome! Unfortunately, I do not provide calorie information for my recipes. This is just a personal preference as I have found most calculators to be incorrect. I am really sorry I could be of more help. Thanks again! I made this recipe and it is amazing. It is one of my favorites. Thanks for sharing. So good to hear! Thanks Julie! I made this around this time last year (seriously yum), I’m just lucky like that, and I plan on making it tonight for a quick dinner and then plenty of leftovers for my fiance and I for lunches. But this time I think I am going to go halfsies cabbage and celery and make sure I don’t go sprinkle crazy with the blue cheese like last time. I get near cheese and black out and the next thing I know I’m swimming in shreds and smell like picking myself off of the ground. I’m also going to swap the broccoli out for peas. I have a serious love affair of peas so if it isn’t a dessert, I am usually for adding it into things. I hope it turns out ok! Hey Natalie! You can also use melted butter. Let me know if you have questions. Thanks! I really enjoyed this recipe! I had to customize it to my diet but will make it again! I didn’t use any dairy or meat because I’m vegan. I used chickpeas and fake chicken strips in place of meat and Hampton Creek Ranch as an added topping at the end. I didn’t have any cabbage or green onions so I just used carrots and yellow onion. Nom, Nom, Nom! Thank you!! I’m so happy you were able to make it vegan! Sounds delish!! So I’m trying to figure out a non-spicy alternative to this (not that I don’t love me some hot sauce, but I have an 18 month old who I don’t think would appreciate it so much….). Maybe with BBQ sauce? ? Hey Jenelle! I have never tried this with BBQ sauce, but if you like that flavor I think it will be great! Let me know if you have other questions. Hope you love this! Thank you! I don’t see broccoli or cabbage in the pics but it is in the recipe??? Sorry, the broccoli is underneath everything! You can add it or not, totally up to you, but i love the addition of the veggies. Thanks! Have you ever frozen the leftovers? Amazing – what a creative and delicious quinoa bowl! I cut the quinoa in half to get the right quinoa/non-quinoa ratio for me. 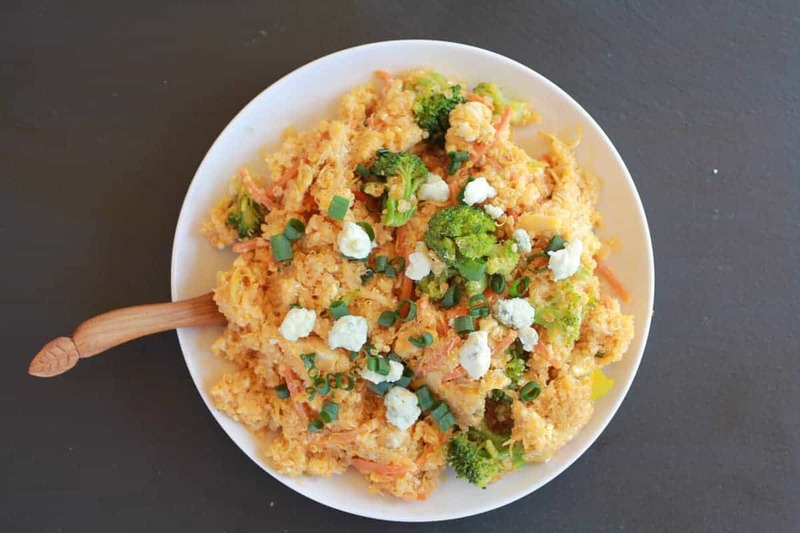 It Works well for leftovers if you keep in 3 separate containers – 1) The quinoa/chicken/broccoli mix, 2) the cabbage/carrot/cheese mix, 3) the buffalo sauce. Sounds like you have it down! SO happy you like the salad! Thanks Nathan! I used cabbage leaves to make cabbage wraps out of this instead of shredding the cabbage. Very good recipe! I just made this meal for me and some friends the other night. i didn’t measure exactly but “doubled it” a tad, and with the sauce I didn’t double the oil and it still turned out delicious!!!! such a quick throw together. So happy you liked this! Thank you Sam! We make this every couple weeks. Very easy and so good! Extra easy when I buy the bag of broccoli slaw mix for the veggies! Thank you so much Christy! I am so glad you liked this and hope you love other recipes as well! Really really yummy. First time cooking quinoa and this wins! I am so happy to hear that! Thank you Al! Made this last night. It was SO good and so easy! Great flavor…it was actually a little on the spicy side for me so I drizzled some ranch dressing. Tasty! Adjustments I made: I didnt mix the sauce with everything as quinoa tends to soak up the sauce; topped with celery for a little crunch, swapped in feta. Yum yum! I will definitely be making again. I am so glad this turned out so well for you and you loved it! Thank you Christina! This sounds delicious! I need to make a dish to make ahead of time and freeze- do you think this would freeze and thaw well and still be good? Can’t wait to try it! Thanks!